This post is part of the Gotta Dance! Blogathon, hosted by Bonnie at Classic Reel Girl. See a list of other participants in this event HERE! The Turning Point is a strange hybrid of dance/backstage and Golden Age Hollywood “women’s” movies. In a year that saw film going through a major transition, with the release of seminal films such as Star Wars and Annie Hall, it seemed a bit of a throwback, even though it had a strong feminist vibe. The script by Arthur Laurents is highly flawed in certain ways. And yet I love it. It had such a strong impact on me when I first saw it during its original theatrical release. It opened up the world of ballet to me. Because of it, I became a regular subscriber to New York City ballet, and each year would try to see whatever visiting ballet companies came to town. Because of it, I was privileged to see Mikhail Baryshnikov, as well as many other extraordinary dancers of that era, perform live. Because of it, I was able to experience the final years of George Balanchine’s career as a choreographer and the director of New York City Ballet. The film’s story concerns DeeDee Rodgers (Shirley MacLaine), a former dancer who is married and raising three children in Oklahoma. She and her husband Wayne (Tom Skerritt), who is also an ex-dancer, now run a ballet school. When their old ballet company hits town, DeeDee is both happy and conflicted about seeing her old friend Emma (Anne Bancroft). Emma went on to have a spectacular career. DeeDee can’t rid herself of resentment because Emma has the fame and artistic respect she never achieved. DeeDee’s daughter Emilia (Leslie Browne) is a talented young dancer. She is invited to join her parents’ old company. They travel to New York for the company’s summer season. Emma has trouble facing that her dancing career is almost at an end. Emilia has an affair with fellow dancer Yuri (Mikhail Baryshnikov) but finds out he a womanizer. DeeDee’s resentment grows as she sees Emma and Emilia become closer as Emilia’s star within the company begins to rise. It all leads to a confrontation where DeeDee accuses Emma of deliberately sabotaging her career by convincing her not to get an abortion when she was pregnant with Emilia. After a physical fight, the two women break down and embrace each other, laughing hysterically. As they recover from the fisticuffs, Emma admits that she would have said anything back then to get the part in the ballet that made her career. DeeDee is grateful to hear that she had been talented enough to be a threat to her friend. It was all she ever wanted to know, she admits. Yes, the plot is on the thin side, and some of the dialogue is overwrought and trite. The movie was criticized for having dance scenes that did nothing to advance the plot or reveal character—which I TOTALLY disagree with. It’s that very thing that gives a strong portrait of how difficult it is to be a dancer. The movie alternates showing the magical moments on stage with the pain, blood, sweat, and tears that make those performances happen. It’s triumph one night and right back to ballet class the next morning. A dancer will leave the stage to applause and double over from exhaustion, only to have to dance back on the stage moments later as if nothing is wrong. It also illustrates how a dance company can be surviving by a slender thread, with constant money worries. It’s a career you have because you can’t imagine doing anything else. It’s a career that, for women especially, means sacrificing many other areas of your life. MacLaine has claimed in interviews that she gets fan letters from male athletes who tell her they strongly identify with both Emma and DeeDee. Either they have had to give up their career before finding out how good they were, or they have hit a certain age and realize they have to find a way to reinvent themselves. More than anything, this is a story about regret, and how it’s a part of everyone’s lives no matter what choices one makes. Both women envy aspects of the other’s life, and will probably always wonder at least a little bit about what might have been if they had taken a different path. For all its flaws, it’s a film that brought ballet to a more mainstream audience and helped make Baryshnikov one of the most famous dancers of all time. The final scene, with the two reconciled friends celebrating Emilia’s success, always chokes me up a bit. Underneath all the soap, there’s quite a bit of truth to that. Instead of making a statement one way or the other (it’s worth it, no, wait, it’s not worth it!) the film leaves the future uncertain, because life is uncertain. In the meantime, Emilia dances, and dances with joy. Debbie, Beautifully written. I have never seen this movie but really want to now! Sometimes light on plot and Mikhail Baryshnikov is just what the doctor ordered–or so my mom taught me ;-). (The only Nutcracker we watched in our household was the one that starred Baryshnikov.) Love the final pictures of Bancroft and MacLaine (the feels!) and Baryshnikov and Browne’s pose. 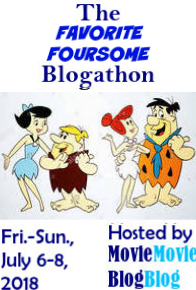 Thank you for participating in the blogathon! Thank you, and thanks for hosting this blogathon! I was fortunate enough to see Baryshnikov dance Don Quixote live with Gelsey Kirkland (who co-starred with him in The Nutcracker). A memory I will always cherish. As far as I know, the only place to see the movie right now is on Netflix, though TCM does show it occasionally. The DVD is out of print and rare. Hope you can catch up with it some time. I, too, used to watch the Nutcracker with Baryshnikov all the time, but I’ve never seen this one. It sounds like a moving and thoughtful story. Those sound like many special memories having experienced Baryshnikov and Balanchine! Like I said in the review, it has its flaws, but overall I really love this movie. If you love dance, then the dance sequences alone are worth your time. Wow, so I guess Herbert Ross was pretty good at directing dance movies! 😉 (I wrote my entry on Footloose, which was also directed by him). Aw, it makes me sad that this movie is sort of forgotten. But happy that I have had an opportunity to inspire some people to check it out. Thanks! Very good review! I enjoyed how they showed all the effort ballett dancers have to put on a daily basis. The themes of regret and “what could have been” never fail to move me.